Turning Torso was completed in 2005 as the world’s first twisting skyscraper. The building rotates 90 degrees along nine irregular pentagonal sections. This rotation is supported by an exterior steel framework. 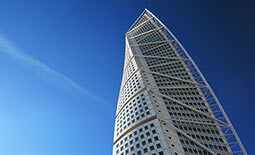 The enormous weight of Turning Torso required concrete of extraordinary strength. By adding our Wiking® Micro Fibres to the concrete mix, the tensile strength was increased and the formation of cracks reduced. At the same time, the fibres function as fire retardant material, minimising the risk of explosive fragmentation in case of fire. Today, Turning Torso is still the tallest building in Scandinavia, and in 2015, the building won CTBU’s 10 Year Award.